My London Fashion Week coverage is published!!! 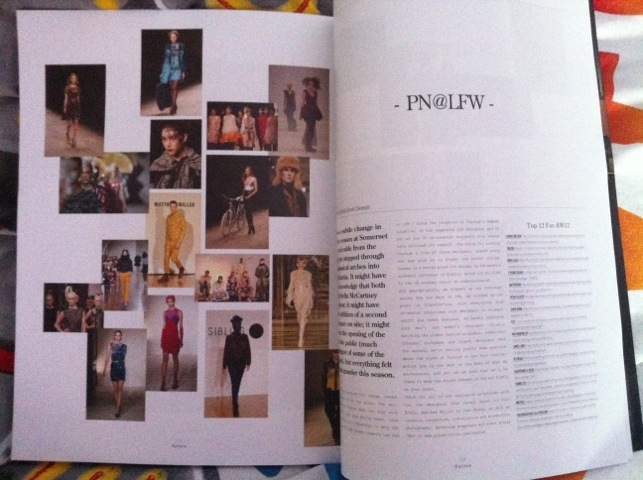 I had such a great time shooting at LFW AW12 and it is so nice to finally see my work in proper print. Lako Bukia for Vauxhall Fashion Scout. I was warned before the show started that at the end there would be a bang and a string of confetti would come out from above the photographer’s pit. I was expecting it. Yet it still made me jump and scream and I missed the shots of the confetti streaming down! However this show was a nicely choreographed one as it wasn’t a simple up and down the runway. The models went up, and then went back to the halfway point and stood in the middle of the runway and stayed there for a while which made for more interesting images rather than the standard walking up and then back down shots. And I appreciate creativity, rather like Carlotta’s smokey runway. However, the make-up and the clothing is what sold this show to me also. Anything Japanesy inspired is an instant love for me so I fell in love with the make-up and the hair. I just wish I knew how to do it all so I could flex the ponytails these girls were wearing. If I remember, KTZ was one of the last shows of a day. And what a cracker it was! At the end the whole crowd roared into applause. I too, in the photographer’s pit cheered. I loved all of the symbols that flowed into the collection and seemed almost ritualistic and occult-like. But then, I love anything with that dark kind of symbolism involved at the moment. Holly Fulton. A show of wonders. Once again, some gorgeous prints. After I had photographed the show I found out from one of Notion’s writers that all of the prints are hand drawn! That is some mighty fine handiwork! So much more respect for the clothing now and the woman herself! Felder Felder was a much anticipated runway show of this season! It was absolutely packed full of guests and the photographers pits was a bit of a squeeze also if I remember correctly. But it isn’t hard to see why. I fell in love with every single print that appeared on the clothing and I also wanted every single dress/skirt/whatever! David Koma certainly showed us that even though it may be a collection for Autumn/Winter, you can still have some strong colour to cheer yourself up with! I particularly enjoyed the pieces with ruffling detail, if ruffling is even a word and not one that I have made up. Dans La Vie for Vauxhall Fashion Scout. Corrie Nielsen was the first runway show of LFW AW12 that I photographed and it was definitely an exciting first show! To have a show with a tartan pattern somehow stuck onto the model’s faces and hair was amazing and definitely excited me for what else was to come during the rest of the week as it was only the beginning! I have read somewhere that Corrie has been described as a similar and new McQueen and I can definitely agree there. However McQueen will never be replaced. It is safe to say. Carlotta was my most favourite show to photograph and in terms of the clothing. She had a smoke machine go off at the very beginning of the runway which made for the most interesting show I have photographed, and then the clothes themselves were also lovely to photograph. I then found out the whole collection was inspired by the holocaust which then explained the smoke machine to me, as well as the wellington boots that some models were wearing. All in all, my most favourite show as well as favourite imagery to have been produced. I love the smoke effect I have managed to obtain in some of the photographs. It definitely gives the image mystery as well as some kind of scary effect.